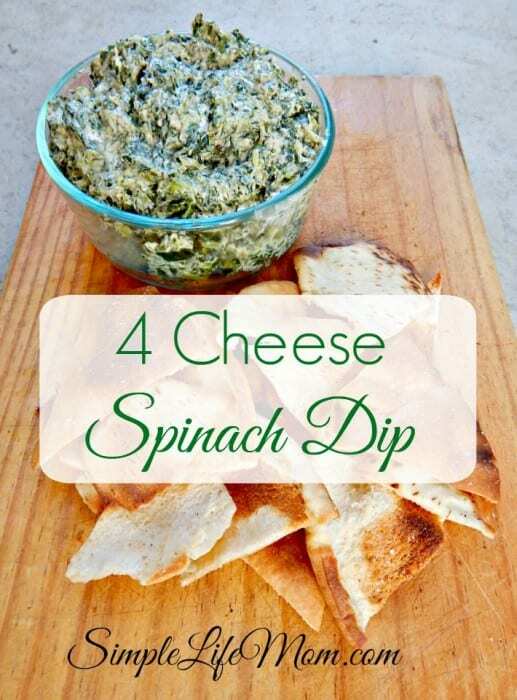 This 4 cheese spinach dip recipe is a fun way to eat a healthier dip. At least, you will get some protein from the many cheeses and great iron from the spinach. It looks green, but my kids love it! It is a fast, frugal, filling, and healthy snack. It’s ultra cheesy and variations can be added for different flavors. This particular recipe does not call for artichoke hearts, but feel free to add 1 cup chopped artichoke hearts if you so desire. They make a great addition. Heat oil in a large skillet on medium heat. Add chopped onion, garlic, salt, and red pepper. Cook onion and garlic until the onions begin to look clear. I don't add a lot of salt to this, because we often eat it with salty corn chips. But if you're going to be eating it with veggies, you may want to add a bit more salt. Turn heat to low and add Spinach and cheeses. Mix together. Cheeses will melt as they heat. You can place a lid on the skillet to speed the process along, but watch that it doesn't burn. When cheeses are completely melted and mixed it is ready to serve. Serve with your favorite Organic Corn Chips, veggies, or crackers. Check out my other dips like Homemade Creamy Onion Dip and Homemade Ranch Dip. I love using dip with chips and this sounds great. Thanks for sharing it on The Yuck Stops Here! recipe link up. I love Spinach dip. Will be “pinning” this recipe and giving it a try! This sounds delicious! Thanks for linking up at Nomday Monday! I love dips and this one looks perfect for a snack with some tortilla chips. Thanks for linking up to Sweet and Savoury Sunday, stop by and link up again. Have a great weekend!! Oh my goodness. This sounds amazing. Of course, how could it not be with all that cheese? 😉 Thanks for sharing this at Savoring Saturdays! I just love this combination for your delicious dip. Thanks so much for sharing this awesome recipe with Full Plate Thursday. Hope you are having a great weekend and come back to see us real soon!